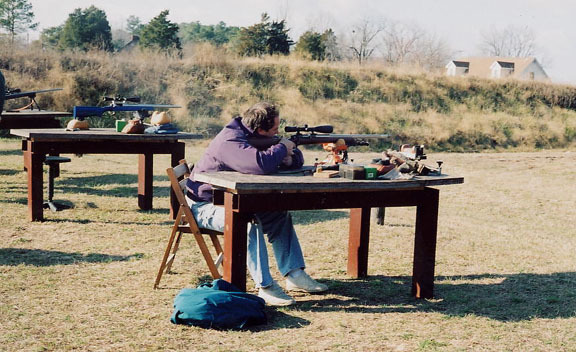 On Dec. 9th 2001, the Bridgeville (DE) Rifle and Pistol Club hosted their first annual 600 Yard Oyster & Chili Shoot. 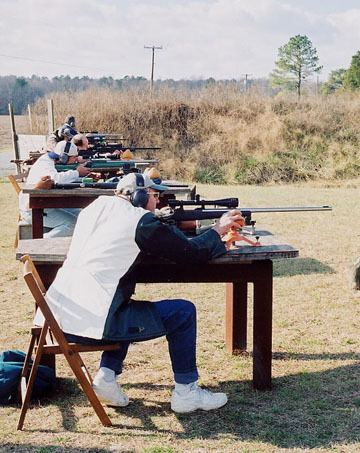 The annual Oyster Shoot is a tradition of the recently shutdown Salisbury MD Gun Club that has been picked up by the Bridgeville Club. This match is an informal, non-registered group match, and was held to have some fun and raise a few dollars for the club, as they are building facilities for the range. 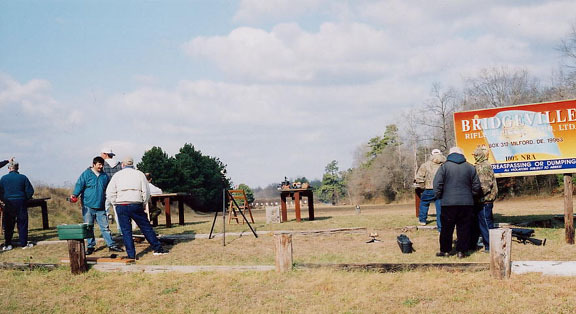 The shoot was organized and run by Bill Truitt (Bills Accuracy Shop billsaccuracy.com). Format for the shoot was five shot group, with each shooter (rifle) shooting two five shot relays. Only the smallest group for each shooter was counted. The day of the shoot was cold and sunny, with VERY high winds that constantly switched, and never seemed to let-up. Just what you wouldnt want to shoot 600 yards in! About 20 competitors showed up, with rifles ranging from old iron sight surplus Mausers to full custom NRA High Power rifles. Chamberings ranged from .223 to .PPC to 300 Ultra to .30-.338. The shoot quickly turned into a contest between a custom groundhog rifle chambered in .22-250 Ackley with a slow twist barrel (Craig Kostyshyn) and a 6BR High Power rifle set up for 107 gr. bullets (Chet Stanchie). In the end, the .22-250 Ackley shooting 55 gr. Vmax varmint bullets posted a 5" group to barely edge the 6BR with a small group of 5 1/8". Despite what should have been a ballistic advantage with respect to wind drift, it just didnt seem to be a day for the big bore rifles. 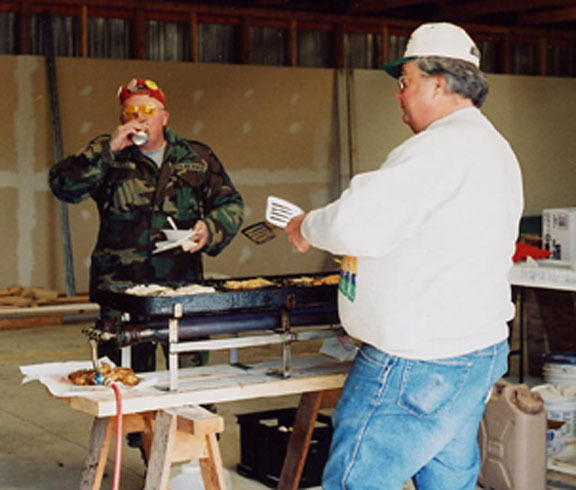 Bud Collison, as well as shooting a respectable fifth place group with his 30 BR, whipped up a batch of awesome chili, and George Calloway cooked up a mess of delicious deep fried oysters during the match. Kudos to the Chefs! Much 'BS'ing was done, and a good time was had by all. Below are some match results and a few photos. 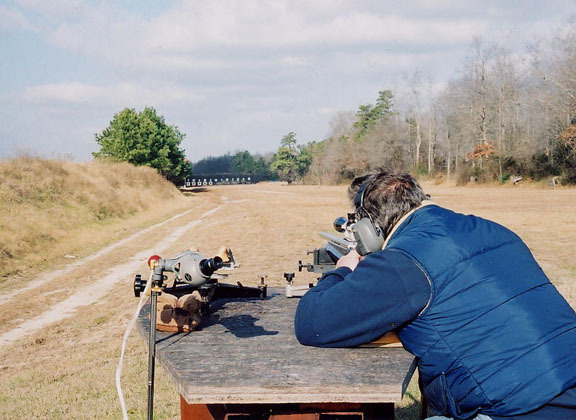 The Bridgeville Club is hosting another informal 600 Yard shoot on Sunday January 27th, and the Bridgeville Chefs will be cooking up a mess of BBQ pork. Count me in! The Bridgeville 600 yard range with various competitors attempting to psych each other out with shooting BS and big guns. The club has recently committed to building a permanent covered 10 bench firing line for the 600 yard range. Yeah! 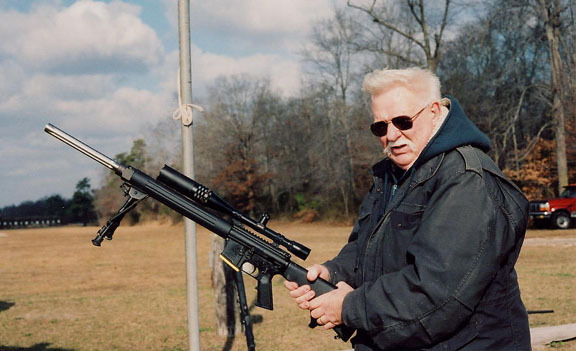 Heres a wild looking rifle. An AR with a 36x Weaver set up for 80 gr. bullets. (Sorry, I cant remember this gentlemans name.) Unfortunately, this gun didnt get sighted-in properly, and we werent able to see what it could do at 600 yards. Im sure hell be back. Down to business. The firing line during one of the relays. In the foreground is 2nd place finisher Chet Stanchie, in full High Power regalia shooting a custom 6BR chambered for 107 gr. Sierras. Nice sneakers Chet! Above is Bill Death Roll Barwick (of IBS Score fame). Bill is looking chagrined for good reason. He let Wayne France shoot a relay with his rifle and Wayne proceeded to shoot a nice 6 3/8" group for the 3rd place finish (Bill wasnt in the money). Word is Bill has his .243 Ackley shooting bugholes with 58 gr. Vmaxes at over 4000 fps, and is returning for the Jan. 27th 600 yard shoot looking for .22-250 Ackley hide. Shown is Wayne BR France shooting his 3rd place group with Bill Barwicks .243 Ackley. Ha! Wayne had cased his 6BR for the day, as it didnt seem to be performing. Seen in the distance are the 6 tall targets at 600 yards. Also to the left the wind flag is barely seen one flag atop a 50 pole at ~300 yards! Heres a pix of 1st Place finisher Craig Dont Mess With My Mojo Kostyshyn shooting his ballistics-defying .22-250 Ackley with what was reportedly leftover groundhoggin ammo from last summer. 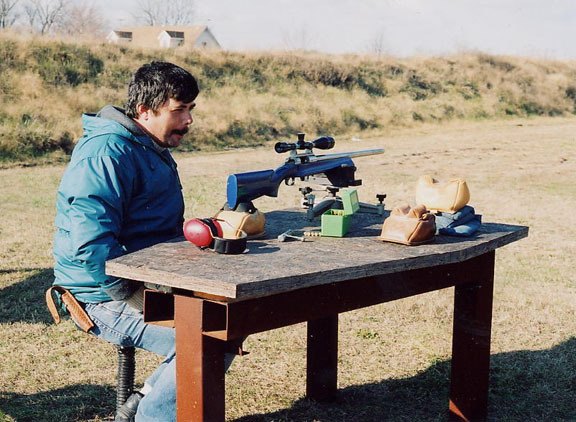 As seen here, Mojo was still waiting to shoot well into the 7-minute time allotment, long after the other relay competitors had finished firing. Hmmmmm . . .
Oh Yeah, Nice sneakers Craig! 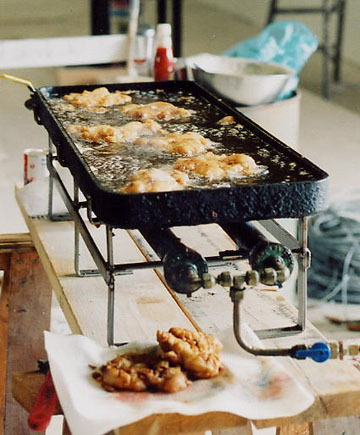 Fresh oysters, deep fried to perfection in special batter - Maryland style. Awesome! The real hero of the shoot, one of the Chefs Extraordinaire - George Calloway. Kudos to the Chefs! Clubhouse construction is visible in the background. Word is the Bridgeville Chefs have 45 pounds of pork they're going to BBQ up for the January 27th shoot. This informal 600 yard shoot was a lot of fun, with great food, a lot of camaraderie, and a few bucks being raised for the Club. A big Thank You to chief organizer and Rangemaster Bill Truitt and to all of the members of the Bridgeville Rifle & Pistol Club. There will be another 600 yard shoot on Sunday January 27th. Contact person is Bill Truitt at bill@billsaccuracy.com. The clubs website is at www.bville-rifle-pistol.org/.